Materials and Methods: Forty-one patients who underwent RC and W-shaped ONB creation between July 2015 and January 2018 were enrolled. Data were analyzed in terms of voiding patterns, urodynamic findings, and functional outcomes at 6 months after surgery. Pouch-related quality of life (QoL) was assessed using European Organization for Research and Treatment of Cancer (EORTC) Generic (QLQ C30), Bladder Cancer-Specific Instruments (QLQ BM30), and IONB–Patient-Reported Outcome (IONB-PRO). Results: The mean length of follow-up was 19.4 months. At first follow-up, three patients had developed acidosis and rising serum creatinine, and one of them required temporary hemodialysis. One patient developed urethral-pouch anastomotic stricture, which required bladder neck incision. Balloon dilatation was performed for ureteroileal anastomotic stricture and mesh repair for incisional hernia was required in one patient each. Upper tract changes were observed in two patients. During the first and second follow-up, maximum flow rate, voided volume, and postvoid residual urine were 12 ± 4.7 mL/s, 212 ± 120 mL, and 72 + 81 mL and 14.7 ± 5.3 mL/s, 254 ± 168 mL, and 123.7 ± 42.5 mL, respectively. The mean pouch capacity and compliance were 436 ± 103.5 mL and 50.6 ± 17.8 mL/cm H2O. No patient required clean intermittent catheterization for bladder emptying. In EORTC QLQ-C30 questionnaire, the “Cognitive” domain had the highest and “global QoL” domain had the lowest level of functional scores. “Nausea and vomiting and abdominal bloating and flatulence” domain had the lowest level and “financial difficulties and urinary symptoms” had the highest level of symptomatology in EORTC QLQ questionnaire. The IONB-PRO questionnaire showed the highest level of functioning in “relation life” and the lowest level in “emotional life” domain. Conclusion: The Ghoneim pouch has a low complication rate with near-normal voiding patterns with an acceptable QoL impairment. The increase in attention towards health-related quality of life (HRQOL) issues has led to the widespread utilization of orthotopic neobladder (ONB) formation after radical cystectomy (RC). The basic principle of an ONB is the presence of an intact rhabdosphincter for continence. An ideal neobladder, like the native bladder, should be a well-compliant, nonabsorbing, nonrefluxing reservoir in the storage phase and should empty completely during the voiding phase with high flow at low pressures. However, patients with ONBs void by relaxation of the pelvic floor musculature with a subsequent voluntary increase in intra-abdominal pressure. As they are constructed from bowel segments, most ONBs are absorptive and their voiding patterns closely resemble that of a severely underactive detrusor. Thus, the search for an ideal ONB is far from over. ONBs are also associated with a plethora of complications, both perioperative and long term, and the reports on long term QoL and functional outcomes are inconsistent and varied as compared to the more traditional form of urinary diversions such as the ileal conduit.,, The need for continued clean intermittent catheterization (CIC) is a realistic outcome in many of these patients, which greatly increases the chances of bacterial colonization of the ONB. Antireflux ureteric anastomosis has been advocated to guard against the colonization of the upper tracts and limit the episodes of pyelonephritis. However, the effectiveness of most of the described techniques is marginal and the chances of anastomotic stricture are fairly high. The serosa-lined extramural-tunneled ureteroileal anastomosis, as described by Abol-Enein and Ghoneim was reported to be very effective in preventing reflux with the advantage of having a very low stricture rate. Unlike Studer's pouch, shorter length of bowel is used and the procedure is technically easier. There have been multiple reports on the pressure volume characteristics and urethral closure parameters of the ONB. In this study, we have evaluated the short-term voiding patterns, urodynamic parameters, complications, and QoL assessment of the W-shapedIONB with nonrefluxing extramural serosa-lined tunneled ureteroileal anastomosis. Forty-one patients who underwent RC and ONB creation with a W-shaped pouch, between July 2015 and January 2018, were prospectively enrolled in the study. The following inclusion criteria were used: (a) muscle invasive carcinoma urinary bladder, (b) recurrent high-grade urinary bladder post-Bacillus Calmette Guerin therapy, (c) high-grade transitional cell carcinoma not amenable to complete resection by staged transurethral resection, (d) urachal adenocarcinoma, (e) good performance status (Karnofsky score >80), (f) age <80 years, and (g) estimated glomerular filtration rate >40 mL/min/1.732 m2. Written informed consent was taken from each patient, and the postoperative protocol was also explained to the patients and their guardians. Open RC with standard or extended template lymphadenectomy was performed by a single surgeon as per the standard procedure in all the patients via a midline infraumbilical incision. The ONB was constructed using 40 cm of terminal ileal segment, isolated on a robust vascular pedicle, at least 15 cm proximal to the ileocecal junction. The segment was first placed in a W-shaped loop, and the arms of the W were sutured together close to the mesenteric border with running 3-0 silk sutures. The bowel segment was then opened all along its length at the antimesentric border using electrocautery. The ureters were placed in the serosa-lined extramural tunnel created by the two walls of the adjoining bowel loops, which had already been approximated using continuous silk sutures [Figure 1]. Ureteroileal anastomoses were made using interrupted polyglactin 4-0 sutures over 6/26 double J (DJ) stents, and these stents were then fixed to the tip of an 18 Fr Foleys catheter, which was brought out through the abdominal wall as a suprapubic catheter. The pouch was then closed and vesicourethral anastomosis was performed over a 16 Fr Foleys silicon catheter, using interrupted absorbable sutures. Starting from postoperative day 2, the reservoir was irrigated with 50 cc of normal saline with sodabicarbonate solution through both the suprapubic tube and the urethral catheter to prevent mucus plug formation and clean the mucus debris. After 3 weeks, the suprapubic tube was removed along with the DJ stents. This was followed by the urethral catheter removal and a voiding pouchourethrogram 48 h later to evaluate for any pouch leak, reflux, and volume of residual urine. All patients were taught to empty their bladders at 3-h intervals initially, in a sitting position by relaxing the muscles of the pelvic floor and applying voluntary abdominal pressure. Crede's maneuver was taught to the patients to further reduce the postvoid residual (PVR) urine. Only those patients who had symptomatic PVR >150 cc or asymptomatic PVR >250 cc were advised clean intermittent catheterization at regular intervals. The patients were followed-up 3 monthly for the first 2 years and 6 monthly thereafter. Voiding was assessed by uroflowmetry at 3, 6, and 12 months and 6 monthly thereafter for 3 years. Frequency–volume charts were made in conjunction to assess the voiding patterns and incontinence episodes. Continence status was evaluated at 3 and 6 months, and the degree of day and night time urinary incontinence was graded as mild (few drops or a single pad per 24 h), moderate (wetness or soakage of underclothes if no pad is used or two or more pads in 24 h), and severe (continuous incontinence or large volume, incontinence leading to soiling of clothes or bedwetting or more than four pads used per 24 h). Complete continence was defined as complete dryness during day and night with no pad use or pad use for safety with no more than few drops of urine leak once or twice a month. Urodynamic assessment of the pouch was performed at 6 months follow-up. Urology trainees, under the supervision of the operating surgeon, performed all the studies. At first, the patient was asked to void. Then, the bladder was emptied using a sterile 10 Fr catheter and PVR was noted. Using a 7 Fr transurethral catheter and a 10 Fr rectal balloon transducer, standard three-channel filling enterocystometry was performed using Laborie Dorado KT (Laborie, ON, Canada) urodynamic machine in sitting posture. Fill rate of 10–40 mL/min using normal saline at room temperature was used till either the patient indicated sensation and urged to void or there was leakage or a volume of 750 mL was reached. Various parameters pertaining to the filling and voiding phase were recorded. In addition free flow uroflowmetry in standing position was also recorded. Contrast study of the pouch was performed at 6 months follow-up. The pouch was filled in the supine position and the patient voided in a standing position. Patients were evaluated with clinical (body weight, vitals), hematological and biochemical (blood counts, renal and liver function tests, and urine routine and microscopy) parameters every 3 months. Radiological assessment in the form of chest X-ray was performed every 3 months and a contrast-enhanced computed tomographic scan of the abdomen and pelvis was first performed at 3 months follow-up and was repeated thereafter as per the disease stage and follow-up protocol. All complications and their treatments were recorded till the last follow-up. Patients were asked to complete the following questionnaires: The European Organization for Research and Treatment of Cancer (EORTC) generic (QLQ-C30) and bladder cancer specific instruments (QLQ-BLM30) and the Ileal Orthotopic Neobladder–Patient-Reported Outcome (IONB-PRO) questionnaire at 1 year following surgery. It includes 15 domains: global health status/QoL, physical functioning, role functioning, emotional functioning, cognitive functioning, social functioning, fatigue, nausea and vomiting, pain, dyspnea, insomnia, appetite loss, constipation, diarrhea, and financial difficulties. Bladder cancer-specific instrument is a 30-item questionnaire assessing urinary symptoms, bowel symptoms, sexual functioning, urine problems, and difficulties associated with the use of a catheter and body image. This questionnaire has been specifically designed and validated for the evaluation of IONB patients and the results were published. A basic of 43 items were produced and organized throughout two clinical and four QoL dimensions (symptoms domain, neobladder self-management domain, daily living activities domain, emotional issues domain, social issues domain and sleep fatigue domain). A total of 41 patients underwent RC and W-shaped ileal ONB with serosa-lined tunneled ureteroileal anastomosis during the study period. There were 36 males and five females. The baseline clinocopathological parameters of all the patients are summarized in [Table 1]. The length of the bowel used was 40 cm of terminal ileum in all the patients. The mean time for neobladder construction including pouch urethral anastomosis was 75.7 ± 36.9 min. The mean duration of follow-up was 19.4 (6–37) months. One patient died on postoperative day 1 due to atrial fibrillation. Adjuvant gemcitabine and cisplatin chemotherapy was administered to 14 patients (34.1%). Two patients died of chemotherapy related febrile neutropenia and sepsis at 5 and 7 weeks postoperatively. Of the 41 patients, 38 patients followed up at 3 months. The mean voided volume at 3 months (calculated as the mean of frequency–volume charts and uroflowmetry) was 212 ± 120 mL. The peak flow rate (Qmax) at 3 months was 12 ± 4.7 mL/s. PVR urine as measured by ultrasound was 72 ± 81 mL. 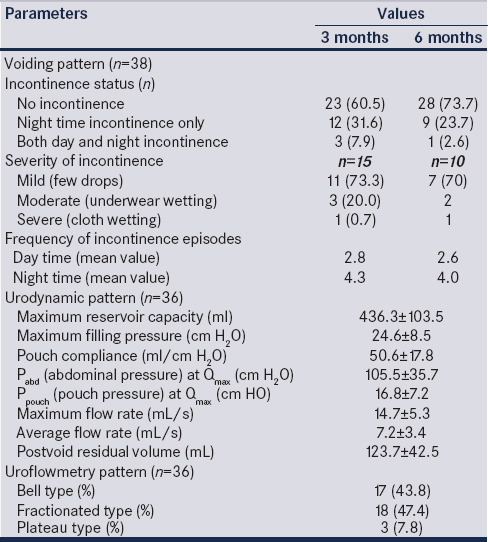 The data on continence status at 3 months are given in [Table 2]. At 3 months, 35 (92.1%) had achieved daytime continence and both day and nighttime continence was present in 23 (60.5%) patients. Only one patient, a 70-year-old diabetic female, had severe stress urinary incontinence in supine position and continuous incontinence in upright position. At 6 months follow-up, 28 (73.7%) were completely continent and 37 (97.4%) had achieved daytime continence. Only 10 patients had some form of incontinence, and of these, only one, the same elderly, continued to have severe incontinence. This patient was later treated with urethroscopic injection of deflux into the mid-urethra and bladder neck and now reports only occasional stress incontinence. Urodynamic evaluation was performed at 6 months in all the patients. [Table 2] summarizes the urodynamic findings. No patient required CIC. Pouch urethrography was performed in all patients at 6 months. No patient had reflux [Figure 2]. Stenosis at the pouch urethral anastomosis was seen in one patient. The postoperative complications are summarized in [Table 3]. Spot creatinine of the drain fluid revealed pouch leak in two patients, both were managed conservatively by prolonged pouch drainage via suprapubic cystostomy and perurethral catheter. Deterioration of the renal function and worsening acidosis on blood gas analysis in the absence of upper tract changes were seen in three patients. One episode each of acute pyelonephritis was seen in two patients at follow-up of 7 and 13 weeks respectively, which were treated by ONB drainage and bladder wash along with intravenous antibiotics. One of these two patients had presented with severe sepsis and renal failure due to bilateral pyelonephritis, and required temporary hemodialysis. Upper tract changes in the form of hydroureteronephrosis were seen in two patients, one of which was due to persistence of preoperative bilateral hydronephrosis, as the renal function remained stable and the radionuclide scans showed nonobstructed drainage. The other patient had increasing left hydroureteronephrosis and cystoscopic evaluation showed left ureteric anastomotic stricture. Balloon dilatation of the stricture was performed followed by rigid ureteroscopy [Figure 3]. One patient showed poor flow on uroflowmetry with high PVR and on evaluation was found to have stenosis of pouch urethral anastomosis which required laser bladder neck incision. Mean scores of questionnaires (EORTC QLQ-C30, EORTC QLQ-BLM30, IONB-PRO) are summarized in [Table 4]. “Cognitive” domain had the highest level and “global QoL” domain had the lowest level of functional scores in EORTC QLQ-C30 questionnaire. The lowest level of symptomatology was reported in “nausea and vomiting” domain and the highest level in “financial difficulties” domain. The lowest level of symptomatology was reported in “abdominal bloating and flatulence” domain and the highest level in “urinary symptoms” domain in EORTC QLQ-BLM30 questionnaire. The IONB-PRO questionnaire showed the highest level of functioning in “relation life” domain and the lowest level in the “emotional life” domain. The quest to provide better QoL has lead to increased utilization of ONB substitutions., Although this form of urinary diversion has been strongly advocated by many, its application still remains variable. There are a plethora of techniques for ONB creation, with Studer's neobladder being the most widely used. In 1994, Abol-Enein and Ghoneim published their experience with the W-shaped IONB with serosa-lined tunneled ureteroileal anastomosis. They followed it up with another report of their series in 1995. The authors reported several advantages of the procedure. First, they used only 40 cm of terminal ileum, which is much shorter than the critical length of bowel loss, beyond which the chances of metabolic complications due to malabsorption would increase. Synthetic staples or non absorbabale sutures were not used. A serosa-lined trough was created, and by spatulating the lower end of the ureter and making a mucosa to mucosa anastomosis, the stricture rates were less than 4%, which compared favorably to that reported after a direct anastomotic techniques., In our series, the mean length of bowel used was 40 cm. All the anastomoses were made using absorbable polyglactin sutures and the ureteric anastomotic stricture rate was 2.4%. The rate of reflux observed by ascending studies in the original series by Abol-Enein and Ghoneim was 3%, and the rate of pouch calculi was 3%. Reflux and stone formation were not observed in any of our patients. Kock's neobladder, which utilizes staples for construction has a high rate of pouch calculi, from 13% to 24%., W-shaped IONB uses a versatile and relatively easy technique, and the serosa-lined troughs can accommodate ureters of any caliber. The surgeon may alter the length and diameter of the ureter to create a good nonrefluxing anastomosis. The spatial configuration of the two neoureteric orifices and the bladder neck closely resembles the configuration in the native bladder. Hence, cystoscopic identification, ureteric cannulation, and upper tract endoscopy is relatively easy. In a patient with ONB substitution, the accompanying voiding dysfunction is always the greatest concern. With the removal of the bladder and the prostate, the spinal and the bulbospinal reflexes contributing to continence are abolished. Therefore, the preservation of the external urethral sphincter and creation of a low-pressure adequate capacity reservoir are important for continence. The patient is asked to relax his sphincter during voiding, which is largely controlled by the intact somatic sacral innervation. This, combined with abdominal straining, with the addition of manual suprapubic pressure when required (Crede's maneuver), means that most of the patients will void with a satisfactory stream with low residual volumes and good continence. In our study, 43.4% of our patients had a bell-shaped curve, closely resembling native unobstructed bladder voiding patterns. Most of our patients had a good capacity pouch with high compliance and low post-void residual volume and none required CIC. Some of our patients reported better flow and bladder emptying in squatting position. Perhaps, the increased intra-abdominal pressure because of the flexion at the hip joint can explain these findings and we encouraged our patients to continue to do so. Incontinence rates in ONB vary from 0%–45% during the day to 5%–62% in the night. Loss of bladder neck, the absence of neuronal feedback from the brain, the absence of sphincter detrusor reflex, and the decreased external sphincter tone at night contribute to nocturnal incontinence in patients with ONB. In our series, at 3 months, 35 (92.1%) had achieved daytime continence and 60.5% were completely continent. Moreover, this improved to 97.4% and 78%, respectively, at 6 months. RC with ONB substitution is associated with significant complications, though the rates and severity are variable.,,,, Most of the early wound-related complications and the gastrointestinal, genitourinary, and infectious complications are related to the urinary diversion. Among the late complications, episodes of pyelonephritis, deterioration of renal function, development of ureteric or urethral anastomotic strictures, pouch calculi, and incontinence are all influenced by the orthotopic diversion itself. Stricture of the ureteroileal anastomotic site is one of the most difficult to manage complication with a reported incidence rate of 2.4%–9%.,, The reported incidence of ureteroileal anastomotic strictures with upper tract deterioration is significantly higher in patients with anti-refluxing anastomoses as compared to the refluxing anastomoses (13.5% vs. 3%).,,,, In our study, the rate of ureteroileal stricture was 2.4% and this complication could be tackled easily by balloon dilatation and temporary placement of a DJ stent. In this respect, the W-shaped pouch provides an advantage over the Studer's ileal neobladder, where endoscopic access to the ureteric openings might be difficult due to the configuration of the pouch (long afferent limb containing the ureteric openings in case of Studer's pouch). Two of our patients had acute pyelonephritis and three had deterioration of renal function in the absence of upper tract dilation. However, all three of these patients had slow rise in creatinine which was below 2mg/dL at the last follow-up. The patient who developed bilateral pyelonephritis with sepsis and renal failure was a long-standing diabetic who had a temporary derangement in the blood sugar control during the acute episode, which might have contributed to the infection. The cause of pyelonephritis in the other patient was unknown. One patient complained of failure to empty the bladder and was unable to self-catheterize at 3 months postsurgery. On evaluation, he was found to have stenosis at the urethral-pouch anastomotic site and required bladder neck incision. Failure to empty the neobladder may also result from dysfunctional voiding due to unsuitable shape and size of the neobladder or from the position, length, and angulation of the neobladder neck or a dennervated proximal urethra. The reported incidence rate of the above complication is 3.5%., Fortunately, in our study, we did not encounter this complication and none of our patients had trouble emptying their bladders at last follow-up. Various authors have reported on the HRQOL outcomes in patients with urinary diversions. Hart et al. did not report any differences in the impairment of QoL amongst the various types of urinary diversions. Henningsohn et al. reported comparable subjective global QoL outcomes between the patients of bladder cancer posturinary diversion and nonoperated controls. Reports in the older literature had concluded that no form of urinary diversion was superior to the other. However, other reports, have suggested that ONB substitution has a better QoL compared to ileal conduit urinary diversion. We used the EORTC QLQ-C30, QLQ-BLM30, and IONB-PRO questionnaire. 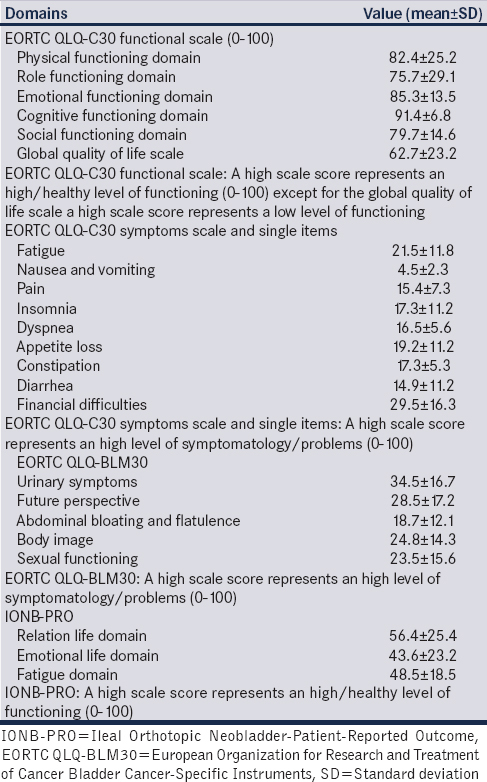 Most patients reported a low level of impairment from the functional scales, symptom scales, and the single items in EORTC QLQ-C30 and BLM-30. Although most of the results are within the range reported by published data, some minor variations have been noted. The results using the ileal ONB-PRO questionnaire in our study showed that ONB substitution is not without its disadvantages. This is supported by an Italian multicenter study which showed that patients with ONBs have mild-to-moderate impairment in HRQOL when investigated by means of generic, disease-specific, and ileal ONB-PRO-specific tools. The choice of type of ONB should also consider the choice of the operating surgeon, since many studies exist on the QoL outcomes of these pouches but a randomized trial comparing the outcomes of various types of ONBs has not been reported. The limitations of the present study are the small sample size and the short follow-up. Moreover, this was an observational study and we did not compare the QoL outcomes with similar matched patients undergoing ileal conduit diversion or other forms of ONB diversions. The W-shaped ileal ONB with extramural serosa-lined tunneled ureteroileal anastomosis is easy to construct and provides acceptable continence and complication rates. The ease of endoscopic access of the upper tracts is an added advantage of this procedure. Urodynamic evaluation and pouchourethrography showed a nearly spherical pouch with near-normal capacity and high compliance with good voiding patterns and pouch emptying closely approaching those of the native bladder. HRQOL questionnaires showed some impairment of QoL; however, these were well within the range reported in the literature. Larger studies with longer follow-up utilizing urodynamic measures and QoL instruments are required to establish this technique as the ideal form of orthotopic urinary diversion. Stein JP, Skinner DG. Orthotopic urinary diversion. In: Walsh PC, Retick AB, Vaughan ED, editors. Campbell's Urology. 8th ed. Philadelphia, PA: W.B. Saunders; 2002. p. 3835-67. World Health Organization (WHO) Consensus Conference on Bladder Cancer, Hautmann RE, Abol-Enein H, Hafez K, Haro I, Mansson W, et al. Urinary diversion. Urology 2007;69:17-49. Hautmann RE, Volkmer BG, Schumacher MC, Gschwend JE, Studer UE. Long-term results of standard procedures in urology: The ileal neobladder. World J Urol 2006;24:305-14. Parekh DJ, Gilbert WB, Koch MO, Smith JA Jr. Continent urinary reconstruction versus ileal conduit: A contemporary single-institution comparison of perioperative morbidity and mortality. Urology 2000;55:852-5. Steven K, Poulsen AL. The orthotopic kock ileal neobladder: Functional results, urodynamic features, complications and survival in 166 men. J Urol 2000;164:288-95. Dahl DM, McDougal WS. Use of intestinal segments in urinary diversion. In: Wein AJ, Kavoussi LR, Novick AC, et al., editors. Campbell-Walsh Urology. 10th ed., Vol. 3. Philadelphia, PA: Elsevier- Saunders; 2012. p. 2431-4. Abol-Enein H, Ghoneim MA. A novel uretero-ileal reimplantation technique: The serous lined extramural tunnel. A preliminary report. J Urol 1994;151:1193-7. Abol-Enein H, Ghoneim MA. Optimization of uretero-intestinal anastomosis in urinary diversion: An experimental study in dogs. III. A new antireflux technique for uretero-ileal anastomosis: A serous-lined extramural tunnel. Urol Res 1993;21:135-9. Madersbacher S, Möhrle K, Burkhard F, Studer UE. Long-term voiding pattern of patients with ileal orthotopic bladder substitutes. J Urol 2002;167:2052-7. Abol-Enein H, Ghoneim MA. Functional results of orthotopic ileal neobladder with serous-lined extramural ureteral reimplantation: Experience with 450 patients. J Urol 2001;165:1427-32. Imbimbo C, Mirone V, Siracusano S, Niero M, Cerruto MA, Lonardi C, et al. Quality of life assessment with orthotopic ileal neobladder reconstruction after radical cystectomy: Results from a prospective Italian multicenter observational study. Urology 2015;86:974-9. Siracusano S, Niero M, Lonardi C, Cerruto MA, Ciciliato S, Toffoli L, et al. Development of a questionnaire specifically for patients with ileal orthotopic neobladder (IONB). Health Qual Life Outcomes 2014;12:135. Hautmann RE. Urinary diversion: Ileal conduit to neobladder. J Urol 2003;169:834-42. Hautmann RE, Abol-Enein H, Davidsson T, Gudjonsson S, Hautmann SH, Holm HV, et al. ICUD-EAU international consultation on bladder cancer 2012: Urinary diversion. Eur Urol 2013;63:67-80. Abol-Enein H, Ghoneim MA. Further clinical experience with the ileal W-neobladder and a serous-lined extramural tunnel for orthotopic substitution. Br J Urol 1995;76:558-64. Helal M, Pow-Sang J, Sanford E, Figueroa E, Lockhart J. Direct (nontunneled) ureterocolonic reimplantation in association with continent reservoirs. J Urol 1993;150:835-7. Studer UE, Danuser H, Merz VW, Springer JP, Zingg EJ. Experience in 100 patients with an ileal low pressure bladder substitute combined with an afferent tubular isoperistaltic segment. J Urol 1995;154:49-56. Stein JP, Freeman JA, Esrig D, Elmajian DA, Tarter TH, Skinner EC, et al. Complications of the afferent antireflux valve mechanism in the Kock ileal reservoir. J Urol 1996;155:1579-84. Hautmann RE, Egghart G, Frohneberg D. The ileal neobladder. J Urol 1988; 139: 39–42. Porru D, Madeddu G, Campus G, Montisci I, Caddemi G, Scarpa RM, et al. Urodynamic analysis of voiding dysfunction in orthotopic ileal neobladder. World J Urol 1999;17:285-9. Jensen JB, Lundbeck F, Jensen KM. 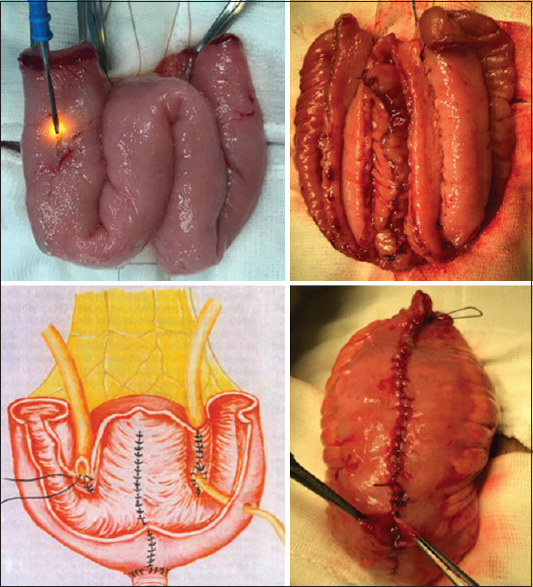 Complications and neobladder function of the Hautmann orthotopic ileal neobladder. BJU Int 2006;98:1289-94. Simon J, Bartsch G Jr. Küfer R, Gschwend JE, Volkmer BG, Hautmann RE, et al. Neobladder emptying failure in males: Incidence, etiology and therapeutic options. J Urol 2006;176:1468-72. Hart S, Skinner EC, Meyerowitz BE, Boyd S, Lieskovsky G, Skinner DG, et al. Quality of life after radical cystectomy for bladder cancer in patients with an ileal conduit, cutaneous or urethral Kock pouch. J Urol 1999;162:77-81. Henningsohn L, Steven K, Kallestrup EB, Steineck G. Distressful symptoms and well-being after radical cystectomy and orthotopic bladder substitution compared with a matched control population. J Urol 2002;168:168-74. Hobisch A, Tosun K, Kinzl J, Kemmler G, Bartsch G, Höltl L, et al. Quality of life after cystectomy and orthotopic neobladder versus ileal conduit urinary diversion. World J Urol 2000;18:338-44. Singh V, Yadav R, Sinha RJ, Gupta DK. Prospective comparison of quality-of-life outcomes between ileal conduit urinary diversion and orthotopic neobladder reconstruction after radical cystectomy: A statistical model. BJU Int 2014;113:726-32. Erber B, Schrader M, Miller K, Schostak M, Baumunk D, Lingnau A, et al. 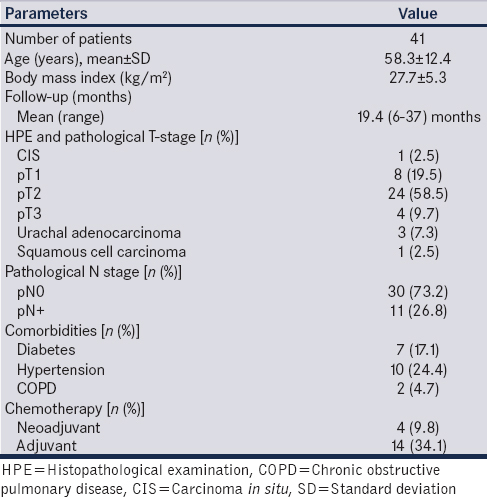 Morbidity and quality of life in bladder cancer patients following cystectomy and urinary diversion: A single-institution comparison of ileal conduit versus orthotopic neobladder. ISRN Urol 2012;2012:342796.